Posted August 11, 2014 by Heather Michet & filed under DIY, Recipes. Place 3 tea bags – or 2 Tbsp. 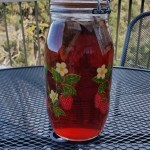 loose tea – in a glass quart jar. Add cold purified water to the top of the jar. Attach lid then place in full sun outside. Pick a spot that will get as many hours of sun as is possible in your yard. After at least 4 hours (you can leave out for several hours, even overnight), retrieve your jar. Remove tea bags, replace lid and refrigerate. If using loose tea, pour liquid through strainer into pitcher and refrigerate. For serving: add lemon, lime or orange slices, fresh mint leaves, sweetener or whatever strikes your taste fancy. The variety of flavors is endless. Mix up the flavors of tea used in a jar to create your own special blends. Sip on!